This LEAF modification will certainly turn some heads at the local charging station. The second generation Nissan LEAF may not currently be the hottest seller in the US market. But globally it remains one of the top 5 plug-in vehicles. There are over 400,000 Leafs owners out there, each with their own distinct tastes. With the improved styling of the second generation LEAF, sales will not be slowing down anytime soon. Statistically speaking, at least a few of these new owners are chomping at the bit for a LEAF mod just like this from Kuhl Racing. Kuhl Racing is based in Japan and offers a number of unique mods for all types of vehicles, including more eco-friendly vehicles like the Toyota Prius. So doing a similar type of mod for the popular Nissan plug-in is an obvious move. Sure, your LEAF or Prius isn't going to be smoking cars at the track. But that doesn't mean you can't look good as that instant EV torque pulls your car out in front at the stop light. Upgrades include an adjustable air suspension, wider fenders, new bumpers, a roof mounted spoiler and a rear diffuser. 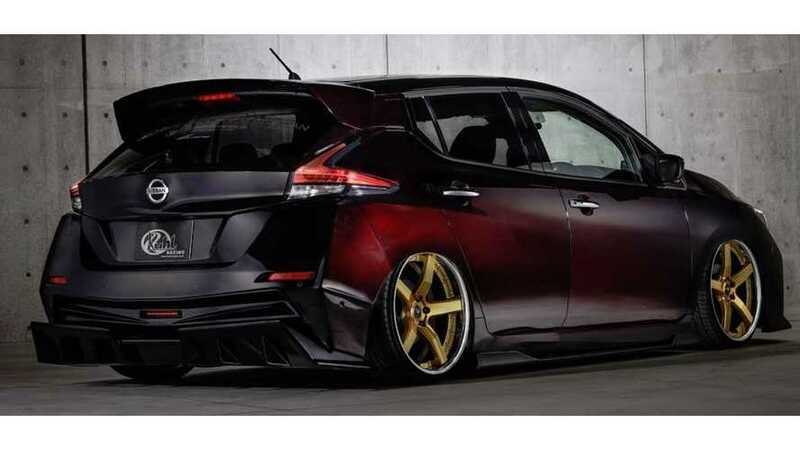 The color is a dark red hue that probably looks slick racing around the streets of Tokyo at night. However, the aftermarket wheels are a bit of an odd choice. The driver side has a gold finish while the passenger side has a more traditional silver finish.